LASIK is an elective laser eye surgery that reshapes the front surface of the eye (the cornea) to improve vision. It is the most popular vision correction surgery performed in the United States and worldwide, although a number of alternatives to LASIK are available. Review other sections of Refractive Surgery News to learn about the choices between LASIK Vs PRK Vs LASEK Vs Epi LASIK. LASIK can correct a wide range of nearsightedness (myopia), farsightedness (hyperopia) and astigmatism. Variations and enhanced versions of LASIK include all-laser LASIK, custom LASIK (also called wavefront LASIK or wavefront-guided LASIK) and multifocal LASIK. The initial step in LASIK surgery is creation of a thin flap of corneal tissue that can be replaced after the laser reshaping of the eye is complete. Anesthetic (numbing) eye drops are applied to the eye to decrease the sensitivity of the cornea and make the process pain-free. A surgical instrumenteither a bladed instrument called a microkeratome or a femtosecond laseris then attached to the eye with suction device and is activated to create a thin flap of corneal tissue. The flap remains attached to the cornea at one end via a small portion of uncut tissue. The flap is folded back on this "hinge," exposing the underlying cornea for reshaping with a second type of laser, called an excimer laser. When the underlying cornea is exposed, the LASIK surgeon positions the excimer laser close to the eye and begins the corneal re-shaping process. 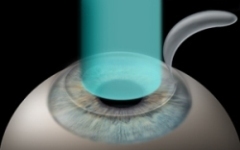 The excimer laser delivers a series of computer-programmed pulses of high-energy ultraviolet (UV) light to the cornea. These energy pulses vaporize (or "ablate") microscopic amounts of corneal tissue to reshape the front of the eye, enabling it to focus light more accurately. The excimer laser treatment usually takes less than a minute. When it is finished, the surgeon repositions the corneal flap and gently presses it into place over the treatment area. The flap bonds to the underlying cornea relatively quickly, with no need for stitches. LASIK can correct a wide range of nearsightedness, farsightedness and astigmatism. The ideal LASIK candidate is over age 21, with healthy eyes and stable vision. Good candidates must also have realistic expectations about their vision after surgery and should fully understand and accept the risks of post-operative complications. To be certain you are a good candidate for LASIK, schedule a pre-operative consultation and eye exam by a qualified eye doctor or refractive surgeon. Can LASIK Eliminate My Need for Bifocals or Reading Glasses? The need for bifocals or reading glasses is due to a normal age-related vision change called the presbyopic condition. 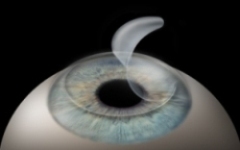 The underlying cause of presbyopia is a loss of flexibility in the lens inside the eye. Though LASIK cannot address the underlying cause, it can treat presbyopia and reduce the need for bifocals or reading glasses in the same way contact lenses canthrough the use of multifocal LASIK or monovision LASIK. These types of presbyopia laser surgery have been shown to be effective for patients from a wide age range. It is normal to experience some visual fluctuations and other symptoms during your LASIK eye surgery recovery, which typically lasts several weeks. Though there is no government agency or clearinghouse that gathers data on LASIK risks and complications, recent research suggests that less than one percent of LASIK patients experience serious vision problems after surgery. Most LASIK complications are temporary and decrease in severity with time. Permanent visual complications can often be resolved with a second LASIK procedure, called an "enhancement." According to industry sources, the average price for LASIK surgery performed in the United States in early 2010 was approximately $2,150 per eye. But LASIK prices can vary significantly, depending on many factors including the type of procedure you choose (conventional vs. wavefront LASIK, the instruments used (conventional LASIK, using a microkeratome to create the corneal flap, vs. all-laser LASIK) and the experience and location of your refractive surgeon. Beware of offers such as "LASIK as low as $399." Often, these prices do not include the cost of pre-operative exams, post-op medications, follow-up visits and other considerations that are included in the LASIK prices of "full-service" refractive surgery practices.